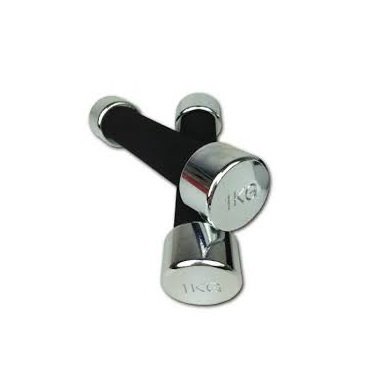 The Dumbbell Chrome 1 kg is a standard design with a comfortable sponge grip. It is a great choice for you. With a strong grip and two chrome heads on the right and the north in black, the weight gives greater strength. The handle is glossy and geometrically designed to give you a strong and comfortable feel with the style that is designed for it. At an affordable and competitive price from your challenging shop which still offers superior quality, performance and longevity. For muscle strength exercises and endurance combined with versatility in weight options for athletes in a multi-mode, a good range of weights can be used to perform almost all types of iron exercises, while also offering a wide range of isolated exercises, rehabilitation as well, strong movements of any size Almost. The types of exercises that can be used for it are back exercises such as saw, chest exercises such as exercise chest level or assembly or lightening. Pips and Traysps exercises. Exercises abdominal muscles and shoulders. Sickness exercises for buttocks, exercises and legs. Excellence for exercises of the upper part such as shoulders, arms, chest and back as well. A privilege for upper body- back exercises.